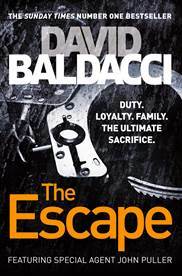 This week I’m thrilled to be partnering up with those wonderful folks over at Pan MacMillan as a stop on the David Baldacci Blog Tour and to offer one lucky reader the chance to win a copy of David Baldacci’s latest books – The Escape (out in hardback last week) and The Target (published in paperback last week). What the blurb says: “Military CID investigator John Puller has returned from his latest case to learn that his brother, Robert, once a major in the US Air Force and an expert in nuclear weaponry and cyber-security, has escaped from the Army’s most secure prison. Preliminary investigations show that Robert – convicted of treason – may have had help in his breakout. Now he’s on the run, and he’s the military’s number one target. John Puller has a dilemma. Which comes first: loyalty to his country, or to his brother? Blood is thicker than water, but Robert has state secrets which certain people will kill for. John does not know for sure the true nature of Robert’s crimes, nor if he’s even guilty. It quickly becomes clear, however, that his brother’s responsibilities were powerful and far-reaching. With masterful storytelling and a quick-fire pace that’ll have you hurtling through the pages unable to put the book down, The Escape is a must-read for all thriller fans. What the blurb says: “A time to kill – or a time to die? The mission is to enter one of the most dangerous countries in the world. The target is one of the toughest to reach. The result could be momentous – or it could be Armageddon. There is no margin for error. US government operatives Will Robie and Jessica Reel have to prove they are still the best team there is. But are they invincible when pitted against an agent whose training has been under conditions where most would perish? The Target hooked me into the story from the very first page. Will Robie and Jessica Reel make for a great, if rather unconventional, duo. With high stakes, and ever-rising tension, this book will leave you breathless. For a chance to win all you need to do is tweet the link to this post (using the Twitter button below) OR retweet one of the CTG tweets about the giveaway. [You’ll also need to follow us on Twitter, so that we can send you a direct message should you win]. (1) One entry per reader (2) UK residents only – due to postage costs – sorry! (3) We will draw the winner at random (4) No cash alternative (5) The competition closes for entries at 9pm GMT on Sunday 30th November 2014 (6) The judge’s decision is final and no correspondence will be entered into. I’ve never read him, but have always wanted to so I’m in! 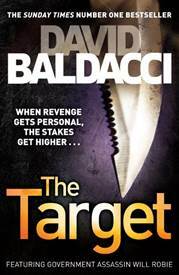 Love all of David Baldacci’s work…..great storyteller.